Every so often, I see something that a juror has written about his or her experience as a juror, and they are always valuable. Some moreso than others. A man named Gerry Walker in New York City wrote a terrific two-part essay about his recent jury service. I hope you will read both parts. Click here for Part One, which will open in a new tab. From there, click on Part Two. See you back here for a little more discussion after you’ve read them. 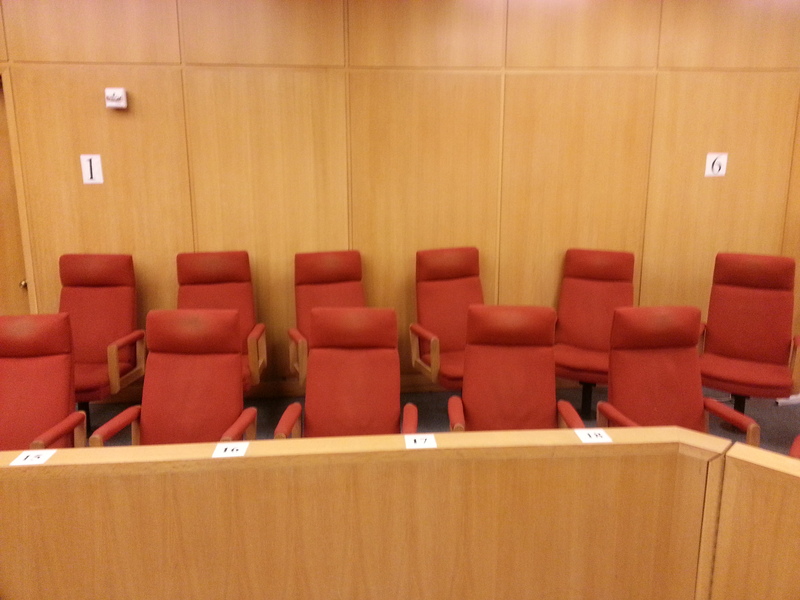 Where the jury jurors sits. I love everything about Mr. Walker’s description of a busy, urban courthouse, including his term “anthill” and taxonomy of the inhabitants. I will also be forever in Mr. Walker’s debt for a turn of phrase that was so brilliant and insightful that I read it a few times just for joy: that he might not be much closer to knowing how our justice system works, but he sure knows how it behaves. Delicious construct. There is at least one more thing to notice from Part One: Something that every layperson juror essay I have ever read has in common (and it’s probably about twenty by now, enough that the genre has some emerging tropes): Every layperson likes the judge. This has some practical implications for trial counsel, which could be further elaborated upon: (a) If given the choice, never let the judge do any of the jury questioning beyond residence/job/family members stuff, because jurors will seek to please the judge and thus skew their answers more than they’ll skew to please the likes of you; (b) If the judge appears to be supportive/skeptical of you, jurors will pick up on it and incorporate some of that. Quit saying the word “jury” when discussing your case and instead say “jurors.” For instance, quit thinksaying, “What kind of jury do I want?” and instead thinksay, “What kind of jurors do I want?” It’s a simple language shift that will provoke a profound mental one. This will force you to incorporate the truth of what Mr. Walker is telling us in rich detail: there is no one, monolithic twelve-bodied singularity called “a jury.” Uh uh. There are six to twelve jurors, each one with his or her own collection of attitudes & experiences that shape every bit of information that is taken in (or not) and that shape every decision they make. Clients ask me, “Will a jury like [my client/my witness/this or that argument]?” I usually answer that some jurors will and some will not, and then elaborate why that either does or does not matter, how we can win, and so on. You want to know maybe the most interesting thing about Mr. Walker’s beautifully told account of his jury’s deliberation? How common the dynamic is. Some jurors start out thinking X; some start out opposite-of-X; a small number might start out somewhere in between or not thinking much at all. Someone will stake out a position; someone who disagrees with it might stake out theirs; it’s often offensive, at least to some of the members of the “other group” . . . and then, infreakingvariably, someone will mention O.J. freaking Simpson (if a criminal case) or the McDonald’s freaking coffee case (if a civil suit). Overall, Mr. Walker’s description of what happened in his deliberations sounded quite familiar. The biggest value in the essay, I believe, is Mr. Walker’s beautifully written and admirably self-aware description of his heart and mind as he jettisoned the mechanical processing of the specific case and engaged the other jurors. I hope all courtroom lawyers will reread the last few paragraphs of Mr. Walker’s essay because it shows the emotional and moral processing of a case by a juror — yet courtroom lawyers generally only think of jurors as processing their case along strict logical lines. Oh, sure, lawyers might occasionally consider the effect of emotion — but it’s usually pejorative and it’s usually about the other side. As in, “Our biggest problem is if the jury starts feeling sympathy for the other side; then we’re in trouble.” (Subtext: because Rightness and Truth are on our side, the only way the other side might succeed is through “cheating” with emotional appeal.) No, when they imagine “the jury” deliberating their case, they usually imagine them working through the verdict forms and mechanically applying the evidence to the law and producing The Right Answer. The best lawyers understand that no human decisions are made strictly along Aristotelian or Euclidean bloodless syllogisms, and that all our decisions are made along emotional/moral/experiential axes. I haven’t missed Mr. Walker’s points about the roles played by race, gender, social and economic class, as well as other unnamed divides such as education and perceived “worthiness” of one’s help or effort. He makes those points powerfully and I’m leaving them to him. My purpose is to illustrate some of the dynamics that we know commonly occur in and among jurors every day in courthouses and focus group breakout rooms (which often drive settlement values) across America. Yes, yes, it’s a closed question, violating my previous advice, so maybe amend it to “Who here has . . .” But I would like to see it trotted out there. Many thanks, Gerry Walker, for taking us inside your experience as a juror. This entry was posted in Jury Persuasion, Jury Psychology & Dynamics, Jury Research, Trial, Writings and tagged communication, deliberations, jury, jury selection, Lawyer, trial, trial consulting. Bookmark the permalink. 1 Response to One juror’s experience. Excellent read. Thanks for this gem Rich. There wasn’t a dull moment.